Don’t let a good garage sale price lead you astray. You should never buy some items at a garage sale, no matter how cheap they are. Not every thrifty find is a good deal, and some could even put you and your family in jeopardy. Skip these items when you see them at garage sales, thrift stores and other places where you purchased used goods. Many families only need their cribs, playpens and other baby gear for a short time. It seems to make sense to pass along their used items at garage sales, but steer clear of used baby gear. Older models can lack important safety features, and some old cribs have dangerous design flaws, like slats that can trap a baby’s head. Materials can also degrade over time, breaking more easily when a child pulls on them. Most experts recommend avoiding used car seats, unless you’re getting them from a trusted friend or family member. If you buy one at a garage sale, you won’t know its history and, with such an important piece of safety gear, you don’t want to take any chances. If the car seat was in a car accident, it could be compromised and may not fully protect your child. In addition, older car seats may lack the safety features of current models, so be sure to get one that’s up-to-date and properly installed. Many firehouses will be happy to check your car seat to make sure it’s installed correctly. This item is crucial, but doesn’t have to break your budget. Here’s how to save money on car seats instead. Whether you’re looking for a helmet for skiing, biking, skateboarding or riding a motorcycle, be sure to purchase your noggin protector new. Any impact can compromise the helmet’s integrity and its ability to protect your head, and buying a used one means not knowing if it’s ever been in an accident. Some communities, such as Seattle, even offer opportunities for kids to get free helmets. Check around to see if your family can take advantage of a similar money-saving program in your area. Sure, it’s kind of gross to sleep on a mattress of uncertain origin. But you know what’s even more disgusting? Bed bugs. Don’t let these little blood suckers in your home on a used mattress or piece of upholstered furniture. Once your home is infested, a single pest treatment can cost $1,500 or more, and these notoriously tough-to-remove critters typically require repeat treatments. Used mattresses and upholstered furniture can also contain mold, stains and odors that are almost impossible to get rid of. That’s why it makes sense to skip these garage sale finds, no matter how tempting the price, says USA Today. Those cute, strappy shoes you found at the garage sale might look great, but they can do some serious damage to your feet. Used shoes are already molded to the original wearer’s foot, so wearing them can cause you foot pain and even injuries. Used athletic shoes are often worn out and lack crucial support, so be especially sure to purchase these new, recommends USA Today. The exception? A gently worn pair might be worth the cost. Dave Ramsey cautions garage sale shoppers to think twice before snagging a cut-rate used blender, toaster or coffee maker. Older models of these kitchen appliances may be fire hazards. Blenders could also have dull blades, and any of these items could wear out quickly. With your safety resting on your tires, it makes sense to buy the most reliable ones you can find. Used tires may lack tread, be subject to a safety recall or could even be rotting. It’s impossible to know what a tire’s been through. It could have been outside for years in sub-zero weather, left to rot in the sun, or even in an accident causing instability. It’s safer to buy these new. Hats are hard to clean, and the ones you’ll find at a garage sale are rarely completely hygienic. A garage-sale hat could have skin, sweat and hair products in it. Unless you can properly sanitize the hat before wearing it — like a cotton beanie you can toss in the laundry — it’s best to skip these. Many older bottles were made with BPA, which was later found to be unsafe for babies and the FDA banned the material in baby bottles and sippy cups. Some bottles may have cracks, and it’s hard to know the history of a bottle. It’s best to purchase safe, new bottles, or at least get them from a trusted friend or family member. While you can find some great cookware deals at some garage sales, steer clear of worn cookware. Rusty items or those with flakes of non-stick coatings will add less-than-appetizing bits to your food, and some people even think they could be hazardous to your health. Always try on your garage-sale finds. If an item doesn’t fit right, be sure to factor in the cost of tailoring, unless you’re skilled with a sewing machine. A bargain dress can quickly turn expensive if you’ll need to hire a pro to make it fit right. Even if you can find brand new and in-the-box makeups and fragrances, steer clear of these at garage sales. These items expire and lessen in quality over time. Open products also contain a host of health risks, and can be laden with bacteria. However, this one’s a toss-up, though — some people even pull makeup out of dumpsters! While it might be tempting to snag a stuffed animal or two to make your kid smile, carefully consider whether or not to bring home plush toys. While some people, such as The Penny Hoarder’s Steve Gillman, find garage-sale plush toys a treasure trove, others have concerns. Stuffed toys can harbor critters, according to Reader’s Digest. The editors note it’s usually hard to wash these fragile creations in water hot enough to kill the potential germs or pests. Be sure to carefully inspect anything you plan to buy. Stores regularly receive notifications from manufacturers about recalls on items deemed unsafe or hazardous. But people selling a few spare items from their garages never receive these notifications. 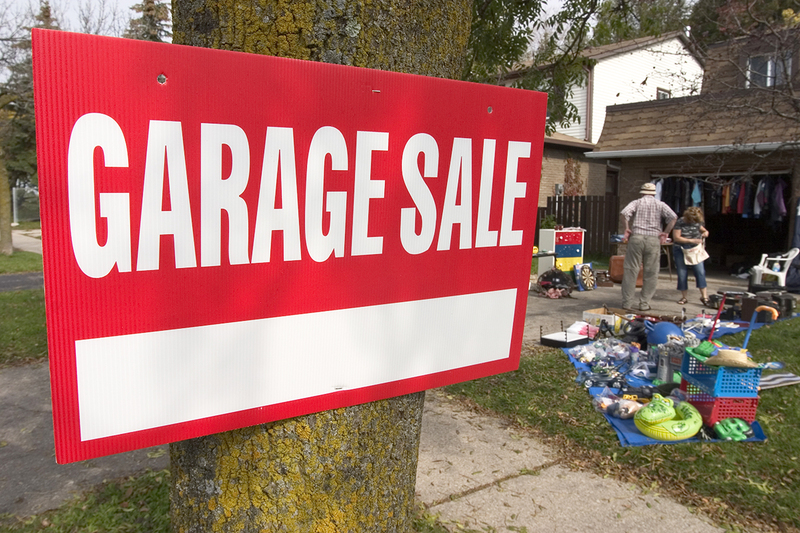 Before you purchase items at a garage sale, make sure they’re not recalled for safety or other reasons. The U.S. government has a website to help you find out if an item has been recalled, so spend a few minutes on your smartphone before you buy. However, not every item will necessarily be listed on that website. Be sure to check with the item’s original manufacturer to see about any relevant recalls before making a purchase.